Delicate and elusive, morels are a gourmet prize that was once limited to those willing to muck around in the wild searching the forest floor for these harbingers of spring. Today they are often found at farmers markets and specialty stores. They are fragile, highly perishable, and resist cultivation (so they must be foraged, or harvested from where they naturally grow wild). For all of these reasons, they tend to be pricey. If you're lucky enough to have a lot of morels, they are at their finest when cooked quickly in butter and lightly salted or tossed on a grill. If you don't have a ton of morels to eat, don't worry. Just a few of these cone-shaped, sponge-textured fungi add a lot of flavor to pasta and risottos (such as this morel mushroom risotto). Morels are particularly delicious when paired with those fellow harbingers of spring, asparagus. A simple sauté of morels (well cleaned and cut in half or quarters) and asparagus (trimmed and cut into 1-inch pieces) is a seasonal favorite when they're both piled high at the farmers market. Morels are usually between two and four inches long, and range in color from pale cream to almost black. 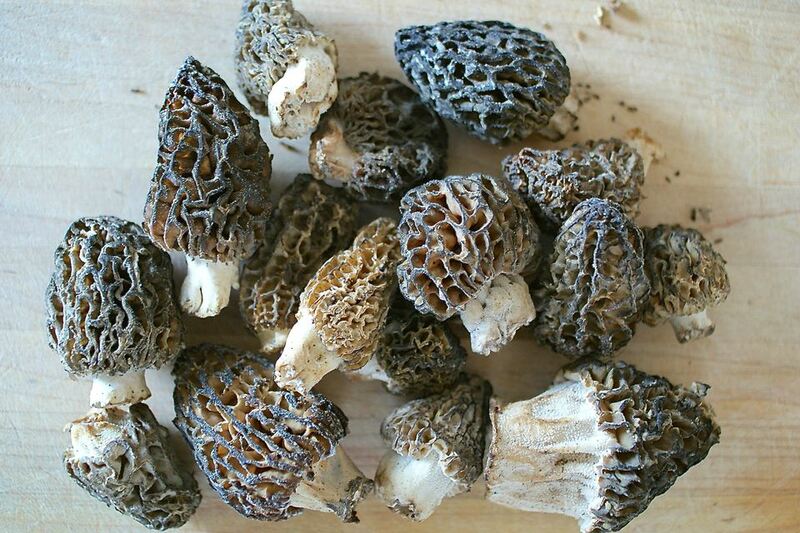 The darker the color of the morel, the smokier, nuttier, and earthier the flavor will be. Look for fresh, plump specimens with cut ends that aren't completely dried out. On that note, avoid mushrooms that feel or look dry or brittle. Also, avoid bruised or softening morels, especially if you're not going to use them immediately since that damage will make them rot quickly. Store unwashed morels in a paper bag and use them as quickly as possible. Time in the fridge is just going to dry them out, but if you do need to store them for more than a day, do so in a paper bag in the fridge so they can breathe, not a plastic one, which can accelerate rot. Don't clean morels until you're ready to use them: they will soak up water, get mushy, and go bad much faster than if allowed to await their fate with a bit of dirt on them. Morels need a bit more cleaning than other mushrooms. Shake them clean, swish them in cold water, lift them out and dry. Don't clean morels until you are ready to cook them since they will have absorbed some water and are more likely to mold or rot if stored after cleaning. You can freeze morels. When you go to use them, they will have a lot of flavors but a completely mushy texture, which is fine if you were going to mince or purée them anyway, but not great for other uses. If you're lucky enough to get a lot of morels, you can dry them to great effect to use at a future date. Dried morels can be quickly and easily reconstituted. Put the dried morels in a small bowl or large measuring cup. Add enough boiling hot water to cover the mushrooms. Let them sit until the mushrooms are soft and pliable, at least 15 minutes (30 is better). Don't throw the soaking water out! It is full of flavor—perfect for risotto, pasta sauce, or to augment the broth in a mushroom-containing soup. Like all mushrooms, morels have deadly imitators. If you decide to try foraging them for yourself, do so with an experienced guide. Mycological societies around the country offer free mushrooms walks and mushroom identification seminars to help get new wild mushroom enthusiasts started. What Makes Sweet Onions Special? Did You Know All This About Avocados and Guacamole?